There is also a rose in high relief between the letter “M” and “R” (Maria Regina) for Queen Mary of Tudor, ruler of England when the cannon was cast. According to the Armouries of H. M. tower, London, this is the only known English cannon with such a monogram. Used on ship and shore, the Falcon proved to be the leading artillery of the period. Taken in 1901 as a war trophy on the island of Samar during the Philippine Insurrection by the 11th Infantry Regiment, United States Army, the Falcon arrived here a then Fort D. A. Russell in 1904 with the return of the regiment. No historic record accounts for the Falcon being on Samar but this style of cannon was used by Drake in the 16th century and the English occupied parts of the Philippines in 1765-1767 and might have left it then. Capt Robert Alexander, quartermaster of the regiment and later a major general was instrumental in bringing the cannon home with the unit. For many years the Falcon rested on an iron mount in front of the post flagpole located four hundred years west on the Marne Parade. Then as the post expanded eastward, the flagpole, cannon and Bells of Balangiga were relocated to this site in Trophy Park. The Military Retiree Council began preservation of the Falcon and shelter construction in 1981, and celebrated the dedication in 1985. Now an important part of the history of Wyoming, the Falcon also represents an important part of the military heritage shared by those serving at Francis E. Warren Air Force Base. In April 1981, Brig General (Ret) Robert R. Scott, Chairman of the Wyoming Military Retiree Council, volunteered that organization’s services to restore the Falcon Cannon and provide a protective display shelter. That offer was accepted. MSgt (Ret) Jerry Bresnahan, an experienced arms restoration gunsmith, volunteered to do the cannon restoration work. Four years and three months later his many thousands of hours of donated labor produced the cannon, restored as best 428 years of exposure would allow. General Scott managed the gathering of all materials needed to do the restoration and construct the shelter the Falcon presently resides. He also raised the funds required to purchase what was needed beyond those materials which were donated. The actual shelter construction was accomplished by members of the Reserve Naval Construction Force, Support Unit 2, of the U.S. Naval Reserve Center of Cheyenne. This was a training exercise for their Reserve Unit. 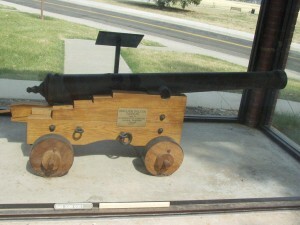 The cannon carriage was designed and constructed by member of the 90th Civil Engineering Squadron. Mr. William S. Hogan was the wood craftsman that built the carriage. The cannon and shelter dedication was held September 7, 1985 and still proudly stands by the flag pole at F. E. Warren Air Force Base.